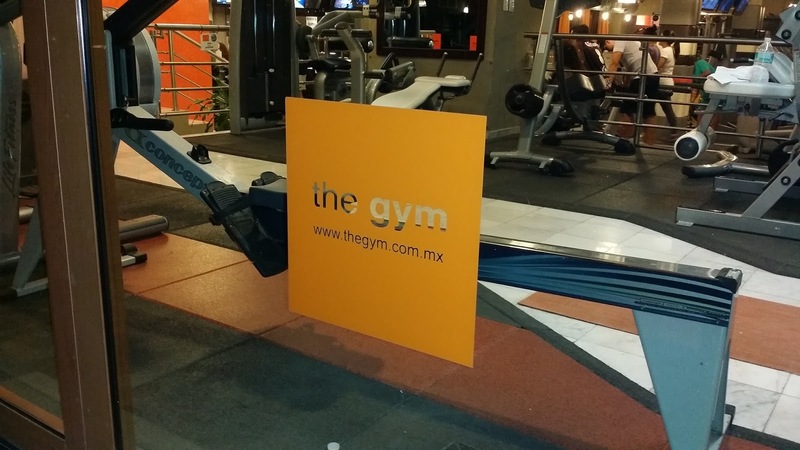 Playa del Carmen is about 45 minutes south of Cancun. While Cancun is a popular tourist destination, to me it seems a dispiriting collection of high-rise hotels, resorts, and American franchises. 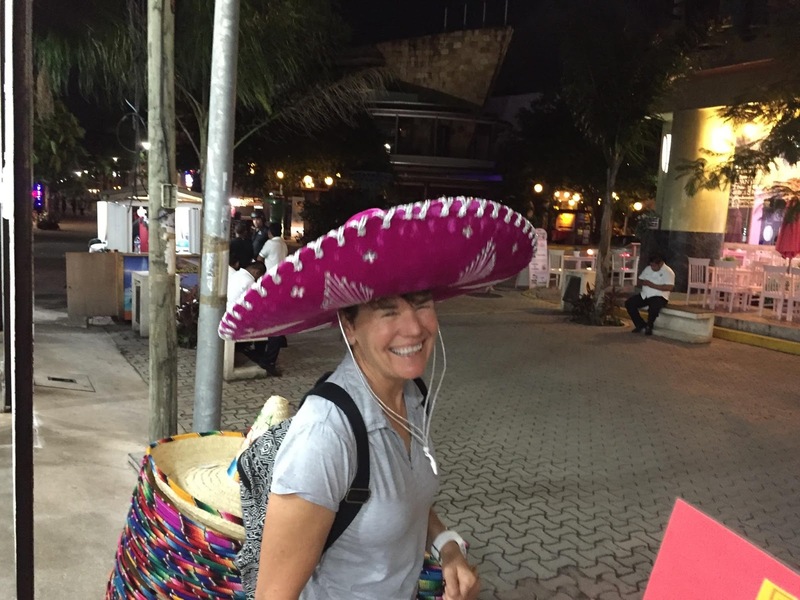 In my cranky opinion, Cancun is best seen in the rear-view mirror while heading south. So is Playa del Carmen an undiscovered, uncrowded gem? It was when we first visited, 16 years ago. Most of the streets were still unpaved, and tourists were European or Canadian, not American, so the food and architecture and general vibe was way hipper and more mellow. But now... Playa is not so Undiscovered. It can be crowded. And the ratio of Americans to other tourists has definitely increased, which unfortunately we contributed to (despite our imaginary Canadian citizenship). 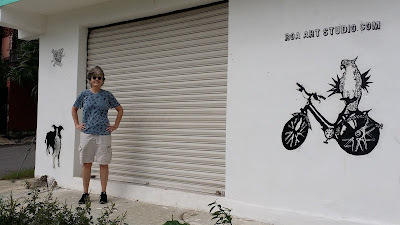 But we knew what we were in for before we went, and it still seemed to have retained more sophistication and charm than typical American-infested tourist destinations. The wonderful thing about it is the combination of urban amenities like great restaurants with proximity to an impressive selection of outdoor diversions. 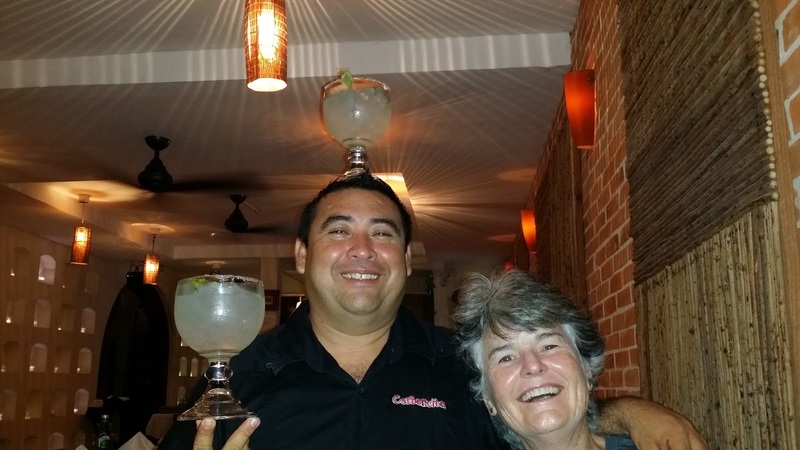 There are lots of intriguing temptations when considering dining options in Playa! However, it wasn't hard to find healthy fare at many of the restaurants. There were even a number of "health food" focused eateries, though we never managed to get to one. Best meal by far was at the restaurant Oh La La, which is small and extremely popular and is often booked up. We stayed up past our usual pathetically early bedtime in order to get a table, but it was so worth it. We were totally blown away by how good the meal was. 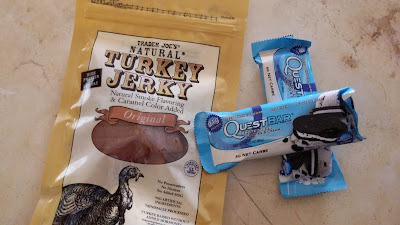 I've gotten so anywhere I travel I like to pack my favorite snacks. These can, in a pinch, replace meals as they contain Protein and Fiber and Vegetables. Yet they are junky enough to be tasty. We were brave enough to buy produce, but not without a little pre-soaking for sensitive American digestive systems. Still, I managed to forget to pack imodium and dramamine, both of which it turned out I needed. 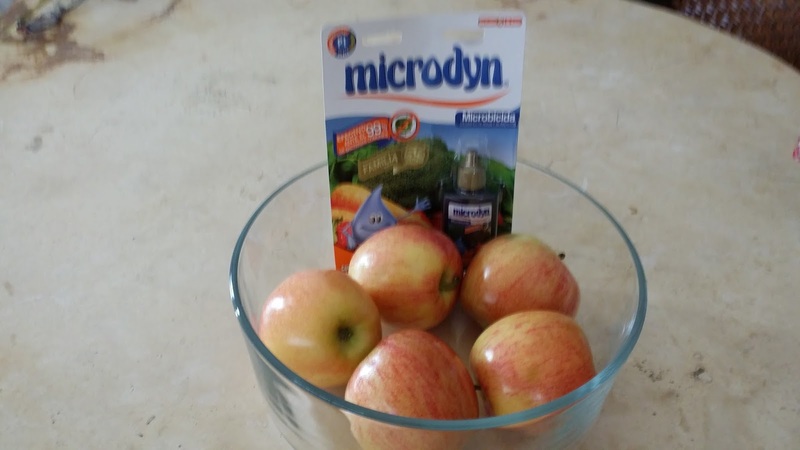 I may have been smart enough to soak the apples, but I kept forgetting not to brush my teeth with local water. Duh, right? And choppy water on the ferry to Cozumel would have definitely had me puking had I not found dramamine. I was very grateful that Mexican convenience stores carried the drugs I stupidly forgot to pack. An even dumber mistake?I was shocked at how tired I was the first few mornings. I blamed the heat, and secretly worried that I'd caught some weird bug or something. Turns out the reason for my stupor? I'd blame my lack of Spanish, but "decaffeinated" ain't that hard to translate. The weather is fairly warm in November (80's during the day, a little cooler at night), which did not deter many joggers we saw, but I hate hot weather exercise so it deterred the f--ck out of me. And I know, how lame is it to hit the gym on vacation? But it made me happy. Our condo/hotel (which we got off VRBO; it was awesome) came with free gym membership. The Gym is a well-equipped and somewhat air-conditioned fitness facility. So I was down there most mornings trying to torch a few calories in anticipation of gluttony to come. Strolling at night is quite pleasant, and the main drag goes for miles and miles and is awesome for people-watching, window-shopping, and sombrero-borrowing. And early mornings were good for strolling the neighborhoods too. Not so much the middle of the day. These pictures look sort of hikey, don't they? 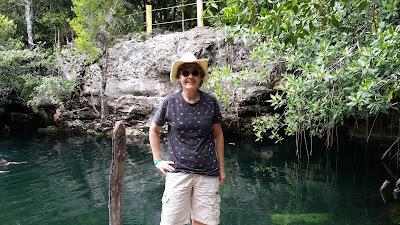 We weren't actually hiking, just checking out one of the many pretty cenotes. There probably is some hiking somewhere but we didn't investigate because it was too darn warm. This is as close as Crabby gets to scuba equipment. 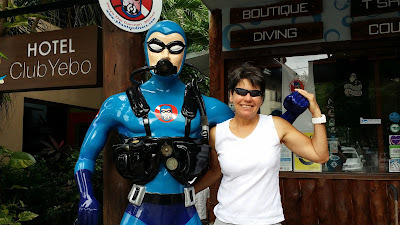 Diving scares the crap out of me, but there are plenty of great diving and snorkeling spots. Cozumel is just a quick and cheap ferry ride away. 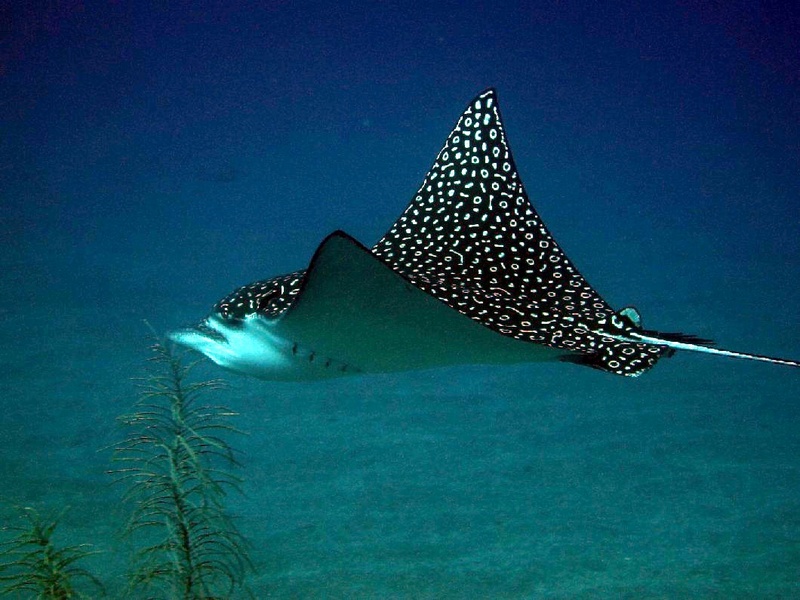 Guess what we saw while we were snorkeling off Cozumel? 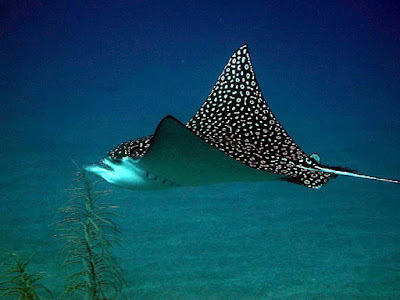 That was not our picture (no underwater camera), but we saw one of these spotted eagle rays pretty close up. It was GIGANTIC and BEAUTIFUL and AMAZING! Possibly the highlight of the trip.And there are lots of other interesting places to snorkel--we went to a lagoon and a couple of other lovely spots. Bonus: if you're too cheap for a pedicure, the fish there will eat the dead skin off your feet for free! Impressive Mayan ruins are not far away; we'd gone to Tulum and Chichen Itza the last time so we skipped 'em this time, but they are definitely worth a visit. We weren't allowed to take pictures (though they're happy to have their photographer sell you some), but oh my goodness was this amazing. 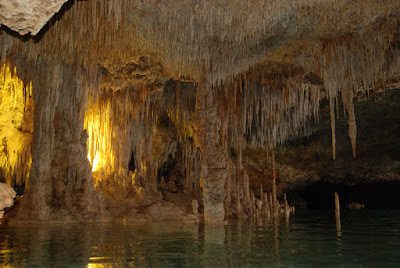 It's an underground river full of stalactites and stalagmites. 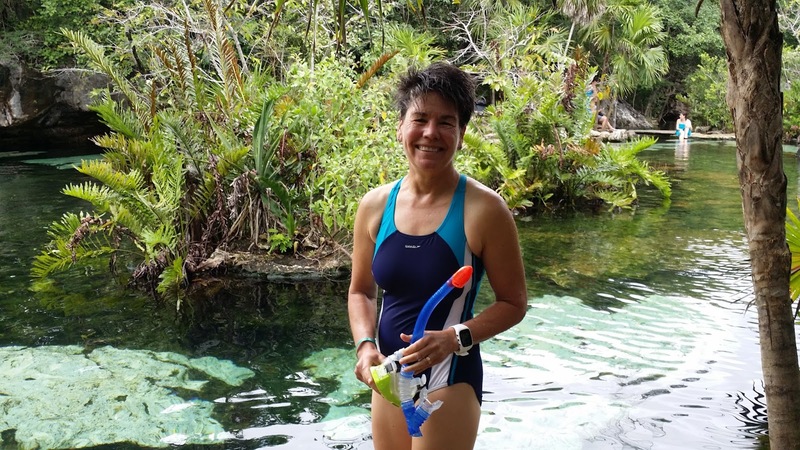 They outfit you with a wetsuit and water shoes (it's a little chilly) and you walk, stumble, slog and swim for over an hour through watery caves with incredibly evocative geological formations. It's surreal and wonderful and the guide was great. They even threw in a decent meal and a Mayan purification ritual, just so we didn't offend the spirits with our crassness while we were wandering around down there. There are beaches and margaritas and massages. 'Nuff said? How about you guys, how was your thanksgiving? Any thoughts on holiday travel, whether healthy or not? I know I should be oohing and ahhing over snorkeling photos and whatnot, but I'm not going to lie. That picture of the Trader Joe's broccoli??? I don't shop there often (just because it's not incredibly convenient to where I live and work, while Sprouts totally is) so I did not know those were a thing. I must try them! We visited with some family & family friends up in Los Angeles this year. We managed to drive up and back during times with no traffic, which for Thanksgiving is pretty much a miracle. We were gone about 24 hours, so mostly it was a nice, leisurely weekend around the house, with no leftovers to tempt us. Glad you had a good thanksgiving OTF! 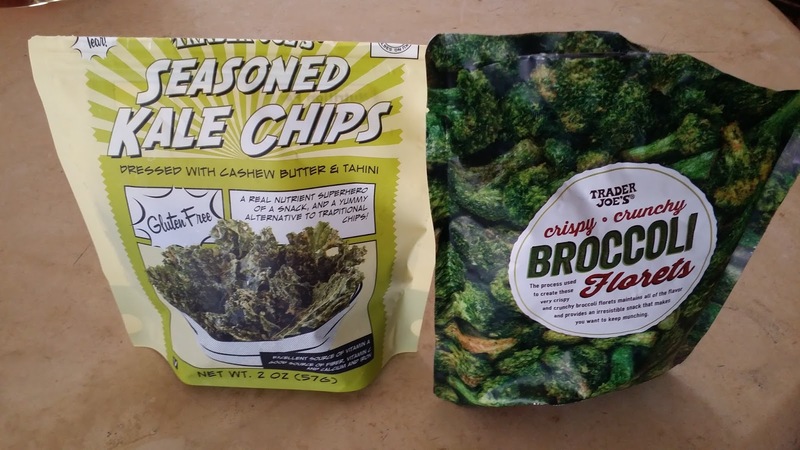 So I could write a whole post on the broccoli florets! Hard to find at TJ's, usually out of stock when I look. They have far too high an oil to broccoli ratio to be entirely healthy, but this makes them weirdly tasty and addictive, it's really almost like eating potato chips even though its broccoli! Gee Canadian Thanksgiving was so long ago I can hardly remember what I did. Oh that's right I had it with my brother and his 3 grouchy teenagers. Yikes!! Nice kids generally but, all those hormones and 3 of them at the same time! My poor brother!!! Acck, Cindy, grouchy teenagers!! Glad you survived, sounds harrowing! And yeah, isn't it weird that our thanksgivings are so far apart? If i didn't have Grandma and Grandpa, with whom i want to spend as many holidays as i can while i still can, i'd love to go on a vacation for a holiday. We just did the usual, which makes us all happy because we got to spend one more holiday together. Aww, a holiday with Grandma and Grandpa sounds like totally the best messymimi! So glad you can still share precious time with them. A beach--an uncrowded, warm, beach--sounds wonderful. It's been too long, yet I've gotten to the point where I don't want to travel. I like home too much. How awesome is it that you love home so much you'd rather be there than anywhere? And leftovers is the great thing about celebrating thanksgiving at home. We ate out and it was weird not to have multiple thanksgiving meals for days afterwards. Glad you enjoyed yours! Even now that I'm "only" working five days a week instead of seven, I still don't get to stay at home enough. We will revisit my attitude to travel when/if I retire. 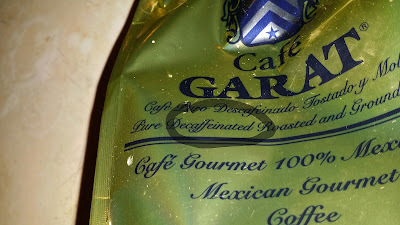 I neglected to express my sorrow for your decaf days. Mexico is awesome! I went there in 2009 and I will never forget it. Hope you get to go again before too long Marie! We eschewed the traditional Thanksgiving this year too and went for a local hike and bike. It felt great to not encounter the "Thanksgiving full" feeling. Thanks for sharing your pictures. I must talk to the hubby - our 25th is in a couple years. 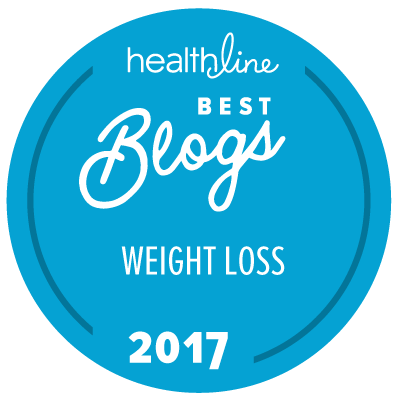 Glad you found a healthier happier turkey day alternative Jan! Glad you had a wonderful anniversary trip!!! Canadian Thanksgiving occurred while I was at the ashram, and I assure you there was no turkey. I have been a vegetarian for five months now. Words I never thought I would type. LOL! Although Mexico looks lovely, one word keeps me away. Diarrhea. I have a sensitive or at least imagine I have a sensitive stomach and my trip would be ruined. I am also not sure about how much Ativan I would need to fly that far. Three hours is my current max. That doesn't bode well for the trip I am supposed to take to Scotland in 2016 does it? 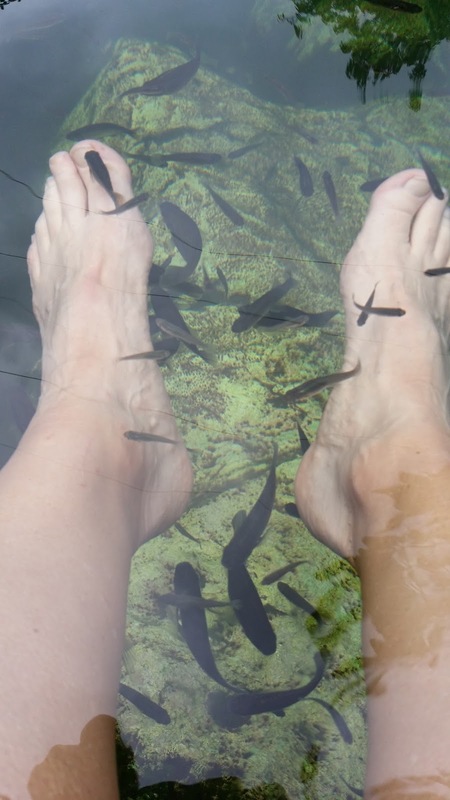 Also, I wouldn't mind trying a fish pedicure. I am not ticklish at all. Kimberley, if you are cautious and not an idiot like I was, it's pretty easy to avoid diarreha in major tourist areas. (Plus a couple immodium and I was fine). Hoping the flying gets better before Scotland! I used to be petrified of flying but finally got over it, so I know it's possible. Good luck, because scotland is awesome! Thanks DRG! And so were you actually home and not pedaling up some exotic mountain range on your bike? Sounds like a wonderful thanksgiving! It sounds just wonderful, Crabby. Amost excellent way to spend your anniversary. It was indeed wonderful, thanks Leah! Wow, what a nice trip, good for you both! I'm glad to see so many smiles! Great coffee story - I can relate, even though I've cut down. It made me nostalgic for travelling in Mexico. We went to Guanajuato and San Miguel De Allende a few years ago, and it was fantastic. Those regions are full of natural beauty, history, culture, art, not to mention killer food. Any good-sized city there tends to have a central jardin or plaza, and the social scene is there every day. People walk around the plaza during the evening doing the paseo, which is a walk around the plaza where everyone sees their friends, meets new people, hangs out in cafes, eats great food, hears music, and spends time seeing and being seen (just like in Spain). I very much wish that we had that type of activity in the US, and I miss it. Great pics, and I now want a massage and a fish manicure! Thanks for the good reviews of San Miguel De Allende as that's definitely on our future itinerary, and am curious about GUanajuato too! So as to a U.S. version of paseo: move to Provincetown! It's definitley a Thing here (in the summer) though instead of just the plaza in town center it includes a two mile stretch of the main drag, which pedestrians take over. Plus, bonus: drag queens! :) San Miguel is more English-friendly, with a significant gringo population (they even have their own newspaper). Guanajuato (the city) is a university town, and has a Don Quixote festival near their almost La Scala-like performance theater.